I guess I'd better thank Turner Classic Movies for making Ginger Rogers their March Star of the Month! This, my own miserable corner of the bloggosphere, has received maybe four times the amount of visitors--and spammers--since Ginger's movies started being shown on Wednesdays. As mentioned before, the most popular search term is "Ginger Rogers [sans clothing]", with "Gloria Grahame [sans clothing]" hanging on to second place; they won't find that stuf here, though, this is a family-friendly blog. 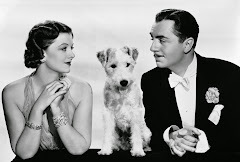 Star of Midnight (our April, 2009 review has new screen caps--take a look), a delightful Thin Man-esque mystery starring Ginger and William Powell, also gets searched a lot, and of course Ginger Rogers Swing Time Dress, which has been lifted from here more than any other photo that *I've* nipped from other sites! I'm thrilled that Ginger still wows 'em! I like to think that she's gaining legions of new fans with every re-airing of Swing Time, and that some drably-attired "T-Shirt and Jeans Girl" will discover the glamour that is the Golden Age of Hollywood. Thank you for this post on Ginger. I agree with you- she is simply marvelous, and my personal favorite actress. Ginger is so wonderful, i can't imagine anyone being able to resist her charm. I couldn't believe it the other week when i was talking to someone (that i didn't know that well) about Ginger. Their actual words were "I've heard of the name, but who is she?" !!! She is amazing- and TCM has picked a good one. Wish there was a picture like the one you posted with her flashing that gorgeous smile. Probably is, Im just too lazy to look! In comparison with Ginger modern actresses look like lacklustre vulgar and in most cases ugly plastic dolls. Actually, they can hardly be considered actresses. She was unequalled in her repertoire. You just never know what people will search for. I adore Ginger and have loved that she has been the star of the month. I just wish all the goodies weren't on so late. I do love her films. Last week we caught the last bit of "Vivacious Lady", one of my favorites. Can u tell me (j045@email.it),PLEASE, any information about the pix u have post? I've found this pix (with the ORIGINAL autograph), in an old my grandmother's trunk, and I want to obtain info about it.